According to statistics, approximately one out of five children need to wear glasses to see accurately. 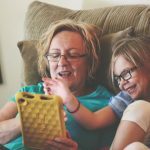 Unfortunately, it can be hard to get children to wear glasses for one of several reasons. Children can find glasses uncomfortable, “uncool” and unstylish, or too fragile for an active life. A comfortable, correct fit is essential for children’s glasses. The frames should not be too big or too small, too close to the cheekbone and not higher than the eyebrow. The frames should fit the face well, and not be wider than the face itself. In general, the smaller the frames the easier it is for a child to forget about them, and not mind wearing them. However, they need to be large enough so that your child can see easily in all directions. An eye specialist needs to help fit the glasses, because the middle of the glasses needs to be adjusted to directly correspond to the middle of the pupils of the eye. It’s also very important that the glasses fit properly on the bridge of the nose. Children have small noses and bridges, so the nose support of the glasses needs to fit very well, and be comfortable, with padding. 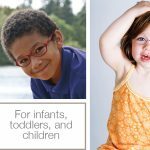 If the glasses sit on pressure points, they will be very uncomfortable, and it’s unlikely your child will wear them. A new feature is gel-padding, that makes the nose bridge extra comfortable. With these features the glasses will be more comfortable to wear. Frame materials for children’s glasses need to have three properties – be extremely strong, break-resistant and light. The ideal frame will be made out of a flexible material that can be bent about without breaking. For this reason, eyeglass frames made of titanium are a good choice, as this material is light and strong. As for the lenses, polycarbonate lenses are more impact-resistant than other lenses and are a good choice for children’s glasses. 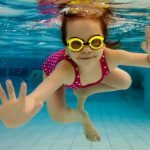 Sports can be particularly challenging for children who need to wear glasses. Glasses tend to slip and slide with strong movements. Special sports glasses for children are available, that are made entirely out of plastic, with temples that don’t include hinges. These glasses include an elastic strap for the head that helps make sure the glasses stay in place. Innovative by design. Crafted with love. Changing the world of pediatric eyewear. The most important part of choosing eyeglasses, is choosing them with your child. Include your child in the choice of glasses, among styles that are suitable. 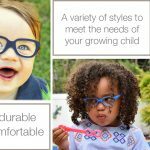 If your child likes the way the glasses look and feel, there is a much better chance that your child will actually wear them. An individualized program of eye exercises and other methods can treat non-refractive vision problems. What's the difference between a school vision screening and a comprehensive eye exam? Knowing the expected milestones of your baby's vision development during their first year of life can ensure your child is seeing properly.